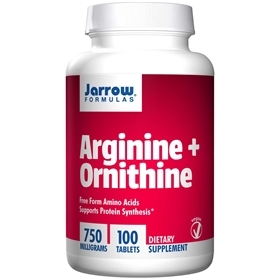 Jarrow FORMULAS Arginine + Ornithine contains only crystalline, pure free form amino acids. L-Arginine is a semi-essential amino acid synthesized by the body from Ornithine. Arginine and Ornithine support protein synthesis as they are involved in the transport and storage of nitrogen. Arginine, as a part of physical performance, is used by muscle tissue to produce creatine. Take 1 to 6 tablets per day in divided intakes, or as directed by your qualified health care consultant. Easy-Solv tablets are designed to disintegrate within several minutes of ingestion. NOTE: If you have a medical condition (especially hypotension or herpes), are pregnant, lactating, or trying to conceive, are under the age of 18, or are taking medications (especially for blood pressure), consult your health care practitioner before using this product. Cellulose, dicalcium phosphate, stearic acid (vegetable source), silicon dioxide and magnesium stearate (vegetable source).